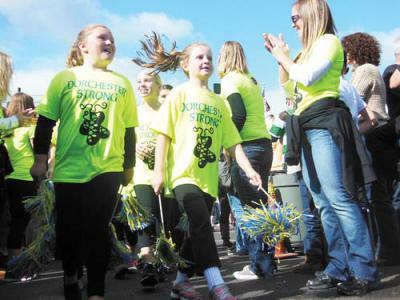 Dorchester’s Irish Heritage Festival is back for its fourth year, with a full slate of Irish music and dance performances, family entertainment, and cultural activities, as well as food and vendor booths. The festival will take place on Oct. 12 from 11 a.m. to 6 p.m. at Florian Hall (55 Hallet Street) and the John McKeon Post AmVets 146 (4 Hilltop St.); there will be a suggested donation at the entrance of $5 per person, or $20 per family, to support the event. Among the acts appearing this year will be acclaimed Maine-based traditional Irish trio The Press Gang; innovative dancer and choreographer Brian Cunningham; Medford resident George Keith, a mainstay of Boston’s Irish music scene; and TR Dallas, one of Ireland’s best-known country singers. As always, the Irish Heritage Festival will be featuring a diverse line-up of performers from Greater Boston and elsewhere in New England. Acts confirmed at press time include: Erin’s Melody; Silver Spears; Devri; Pauline Wells; Ireland the Band; John Dlaton; Mairin Ui Cheide; The Gobshites; The Fenian Sons; Comhaltas Ceoltóirí Éireann; Tin Can Hooley; Erin’s Guild; Tom Lanigan; Noggin; Michael O’Leary; the Boston Fire Department Pipe Band; Patrick Kennedy; Joe Walsh; Paudi Walsh; and Colleen White and Sean Smith. Boston-area Irish dance schools will be well represented at the festival, with the Keane O’Brien Academy of Irish Dance, Clifden Academy of Irish Dance, O’Shea-Chaplin Academy of Irish Dance; Smith-Houlihan Dance Academy; Greene-O’Leary School of Irish Dance, and Brady-Kenny-O’Brien Academy of Irish Dance. The Press Gang has emerged as one of the more exciting traditional Irish music groups in New England, or elsewhere, with a fresh, energetic sound built on the accordion and concertina playing of Chris “Junior” Stevens and fiddling of Alden Robinson, with the backing of Owen Marshall on guitar and bouzouki. The band released its first CD in 2010 and is finishing up a new album. Cunningham, a Connemara native and part of a family of dancers that has performed with The Chieftains, Sharon Shannon and Altan, among others, is equally celebrated for his talents as a choreographer, instructor, and producer. Most recently, he has performed in and co-directed “Atlantic Steps,” a stage production that chronicles the story of sean-nos (“old-style”) dance. Cunningham and Keith will be part of a special sean-nos dance exhibition that will also feature accordion players Paudi Walsh, Joe Walsh, and Sean Gannon, as well as piper Joey Abarta, dancer Jaclyn O’Riley, and singer Mairin Ui Cheide. Westmeath native TR Dallas, a crowd-pleaser at least year’s festival, has made numerous radio and TV appearances during a career spanning more than three decades. He has toured with such luminaries as Johnny Cash, Boxcar Willie, Don Williams, and Foster and Allen. 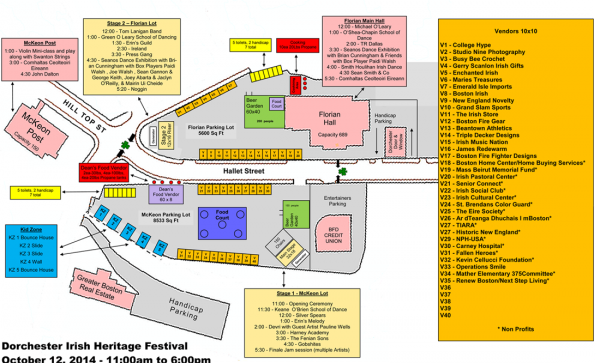 Other attractions at the festival will include John Henry’s World of Magic; TIARA (The Irish Ancestral Research Association), a non-profit organization established to develop and promote the growth, study, and exchange of idea among people and organizations interested in Irish genealogical and historical research and education; and a visit by the Irish Setters Club of New England. Says Ui Cheide, a co-organizer of the event: “Many people have worked hard to make this jewel of a festival a reality. It’s dependent solely on the generosity of Dorchester businesses, and the overall support of the community, not to mention the efforts of a committed neighborhood committee that includes its president, Sean Weir, and my fellow co-chair, Patrick McDonagh. For updates and information on the festival – including a list of vendors who will be on site – see dorchesteririshheritagefest.com.